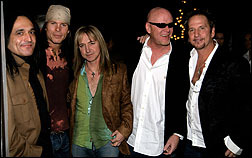 LOS ANGELES (CelebrityAccess MediaWire) — Controversy continues to surround rock band Great White, this time after they announced that they were planning to perform at a charity gig to benefit harp seals. According to the band's website The January 27th benefit concert will serve as to kick-off Great White's 2007 tour but at time of press, additional dates have not yet been announced. The band, notorious for its involvement in the Station Nightclub fire which took the lives of over 100 people, including the band's guitarist Ty Longley has aroused the ire of some of the families of the fire's victims by playing at the tragedy. The families are reportedly upset because a charity that had been established to help those affected by the tragedy has run out of money. The band has responded to the criticism by noting that they have been asked to refrain from fundraising for the charity. "The Station Family Fund wanted to distance themselves from Great White," manager Obi Steinman told the Boston Herald. "They thought Great White's efforts were hindering their ability to raise money."